Making art may well be the best way of tapping into and processing information from the subtle realms. My dreams are rich and vivid, whether they come in sleep or in meditation. Often they don’t make a lot of sense at first and slip away in the rush of the day. I have been writing my dreams in journals for years. Sometimes I share them with friends and family looking for meaning, insight, direction that may be gleaned from them. This type of processing allows more of the dream to be remembered. When I work with clients in a healing session I share the things I perceive to give them the opportunity to expand their awareness of the energy. After the session I encourage them to talk, write or make art inspired by their experience. 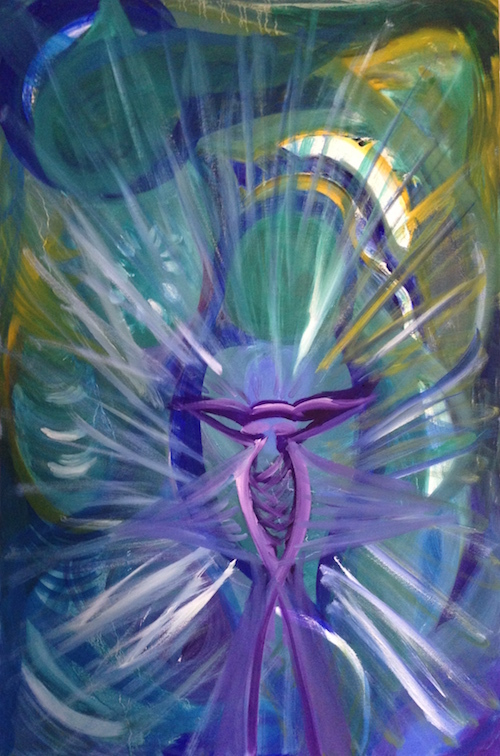 This painting came out of a healing session that I received from Katie Todd a few months ago. I connected with an incredibly vivid blue light and a large, blue galactic being. It’s head extends outward like horns or ears. I sketched it for a while in different ways. Each piece of art allowed me to feel more deeply into the gifts it brings. I am painting and drawing more and more of the things I perceive. Cutting past the thinking mind’s attempts to make sense, art allows us to delve deeper into the vast knowledge that is available to us on the inner planes. An almost daily journal tracks my progress these days. It is such a powerful practice that I wish to share it with others and am in the process of designing a class around it. Stay tuned for more details.